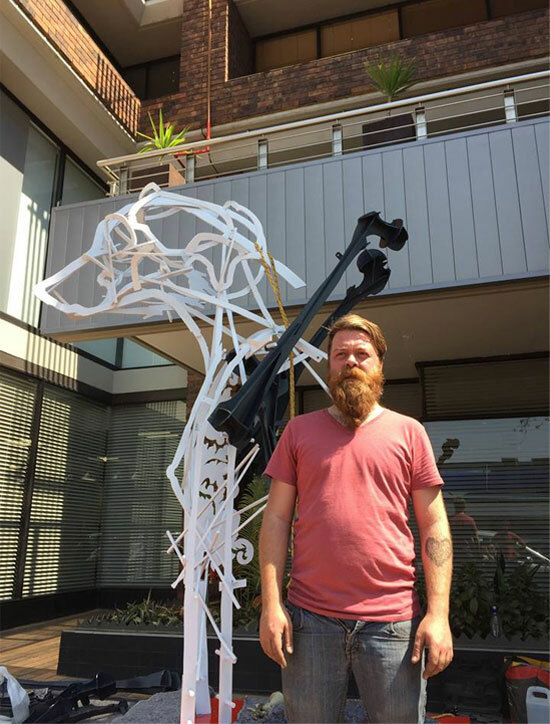 Sculptor Sybrand Wiechers joined forces with Pretoria Technical High School for the 2016 Cool Capital Atterbury Trust Schools Project. 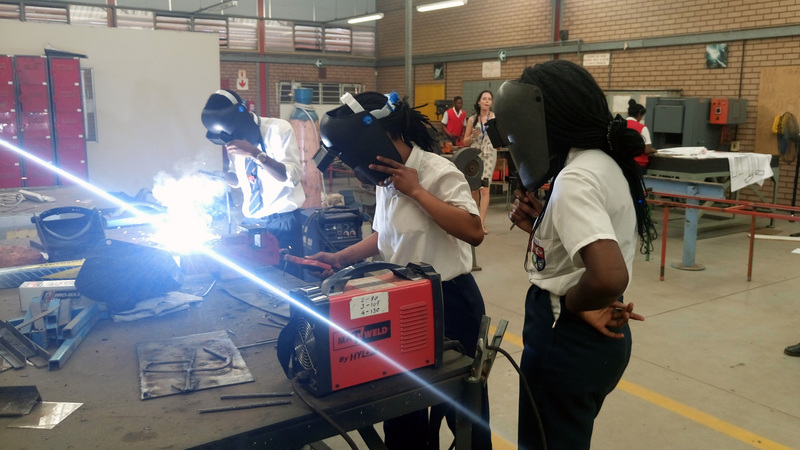 The learners have welded symbols typically used on technical plans that will then be used to construct a winged figure. The sculpture will soon be erected on the school grounds, right opposite the Pretoria Art Museum. 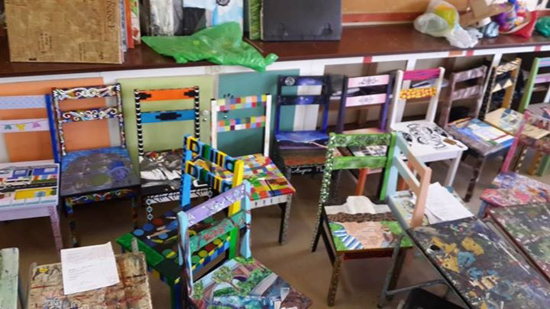 This project not only adds value to the learning environment, but also shows learners that their technical skills are just as applicable in the realm of art. We hope that a new world has been opened to them and that some of them may consider pursuing careers in the arts. 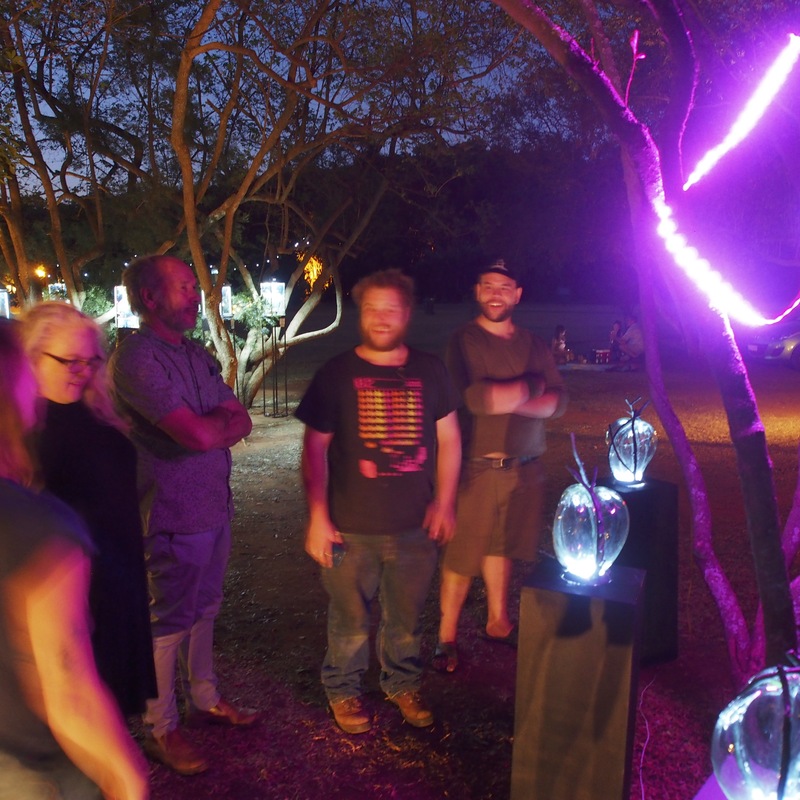 Blow Your Sculpture, an initiative that brings glass artists in Pretoria together, has hosted numerous events during Cool Capital. We're especially impressed with their pop-up exhibition hosted in the Botanical Gardens. The sculptures were beautifully lit under the trees and the band, Jazz Cantina, added to the atmosphere. 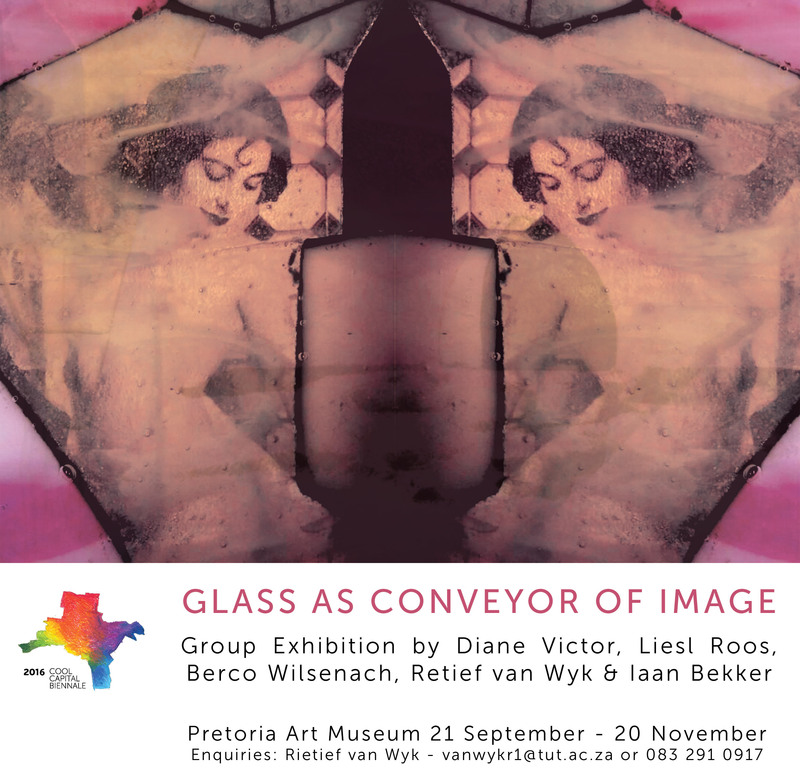 Their next show opens at the Pretoria Art Museum on 12 November - be sure not the miss it! When you're in Muckleneuk again, be sure to stop by the Association of Arts Pretoria in Mackie Street. 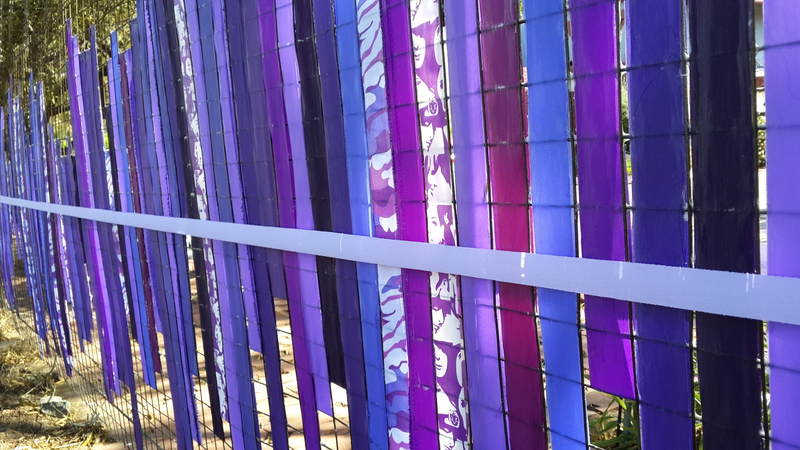 A purple installation, strips of cloth woven into the fence, by artist Franli Meintjies adorns the boundary. Franli's work, entitled 'The Noise We Make' is a direct translation of sound recordings she took in the inner city. Franli was assisted by Molly Madzimbamuto and Amillie Mvula. Well done Franli! A primary school with initiative! 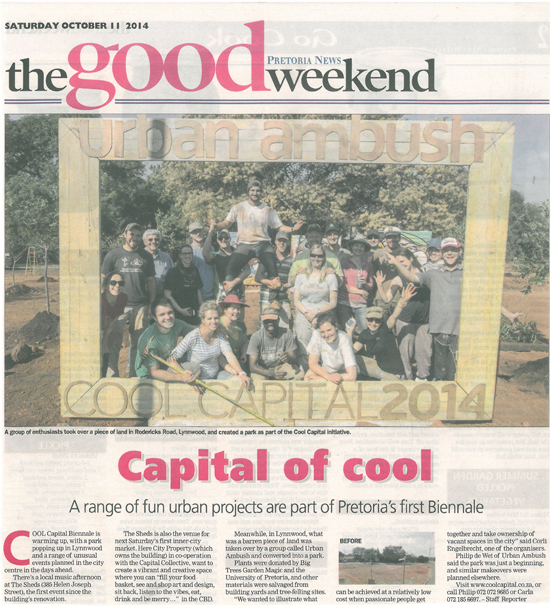 Laerskool Hennopspark was very excited to take part in the Cool Capital initiative once again this year. They decided to erect a statue in the gardens of the school. 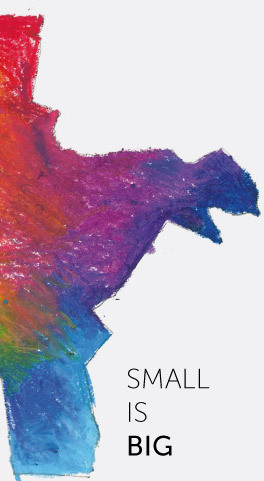 The project relates to the 2016 Cool Capital theme of “Small is Big" and speaks of the big dreams small children have for their futures. These dreams can, however be impeded by certain fears and hurdles along one’s journey through life. Small fears can become big debilitating obsessions which can prevent us from reaching our big dreams and full potential. It is only through facing our fears through our belief in God, that we can overcome these obstacles. The statue is based on Ephesians 6 : 11-17 of a person dressed in the armour of God and was sculpted by Susan Strydom, Hennop’s very own art teacher. 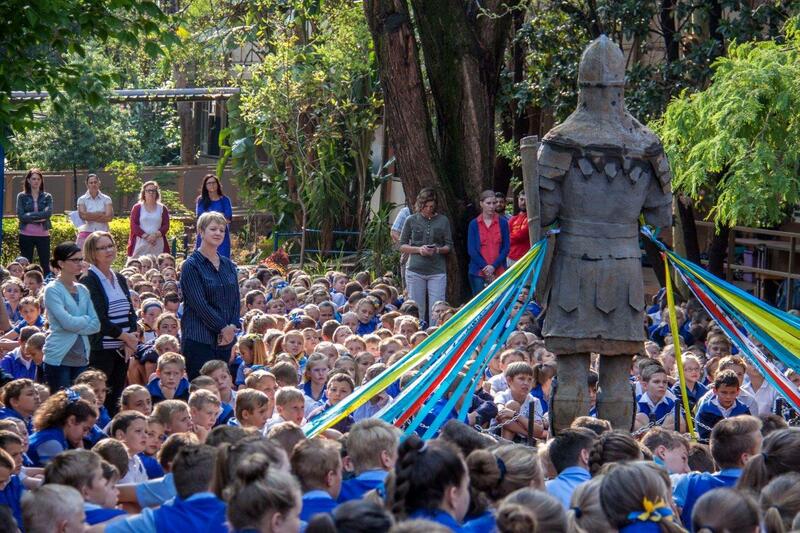 Each of the school’s pupils were involved in the unveiling process, by writing their fears and worries on ribbons, with which the statue was “bound up”. These ribbons were cut by the pupils during the unveiling, symbolising the ability to overcome all fears through the grace of God – and thus enabling them to stand tall and eventually reaching their future dreams. DEURnis is a one-on-one, site specific theatrical production with a very intimate yet cutting edge and experimental approach. It involves a single audience member who views three separate dramatic pieces per night, with each of the pieces having one actor performing for that audience member at a time. Each piece or scene is about 20 minutes long and written for a particular room in a house, so the audience member moves from one room to the next. 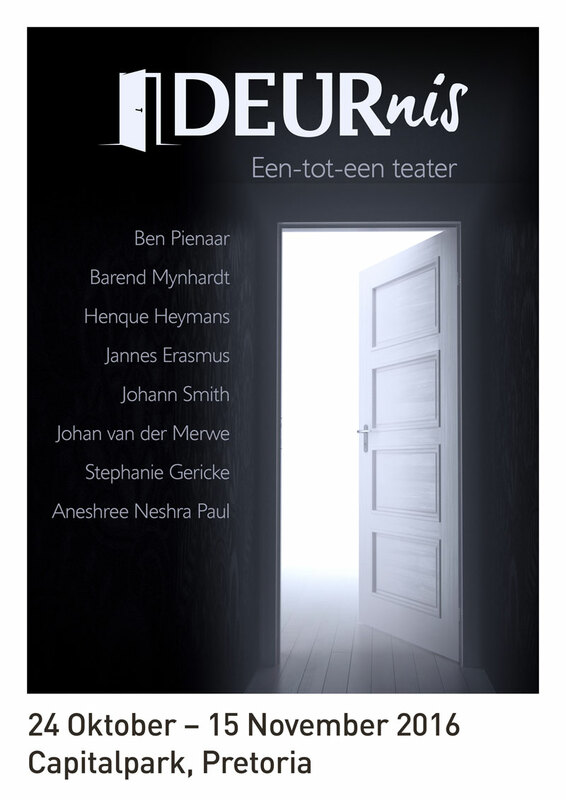 The title of the project, DEURnis, is a portmanteau of the words “DEUR” (Afrikaans for “through” or “door”) and “Deernis”, meaning earnest and compassionate honesty. The title implies that on the other side of the door that leads to the performance, the audience member can expect to experience a work that will be delivered with honesty and sincerity, while being emotionally and socially challenging. Cool Capital is proud to be associated with this exciting project and hopes that the initiative will only grow in the coming months! What if our city were made of books? 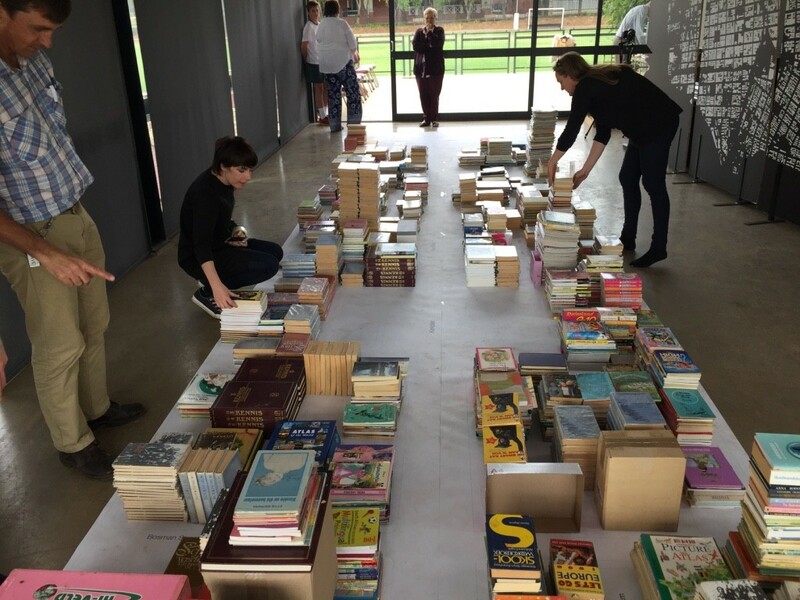 Afrikaanse Hoër Meisieskool participated in a national project to collect books for a primary school in Loxton which had recently burnt down. 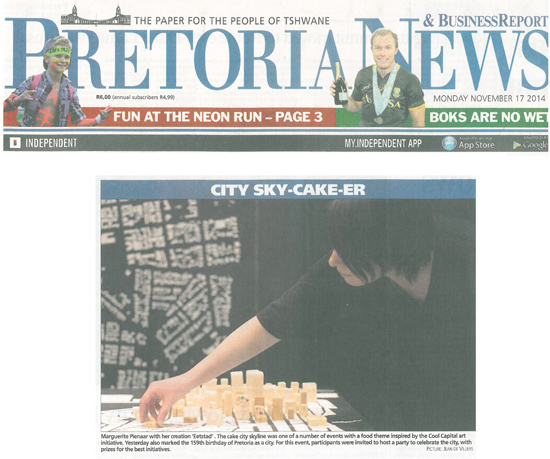 However, before sending the books off, a scale model of Pretoria was built in collaboration with design-trio WitopWit. In the spirit of Cool Capital, this pop-up installation gives us a different perspective of the inner city and perhaps also talks of the many interwoven stories and the lives lived over many years. 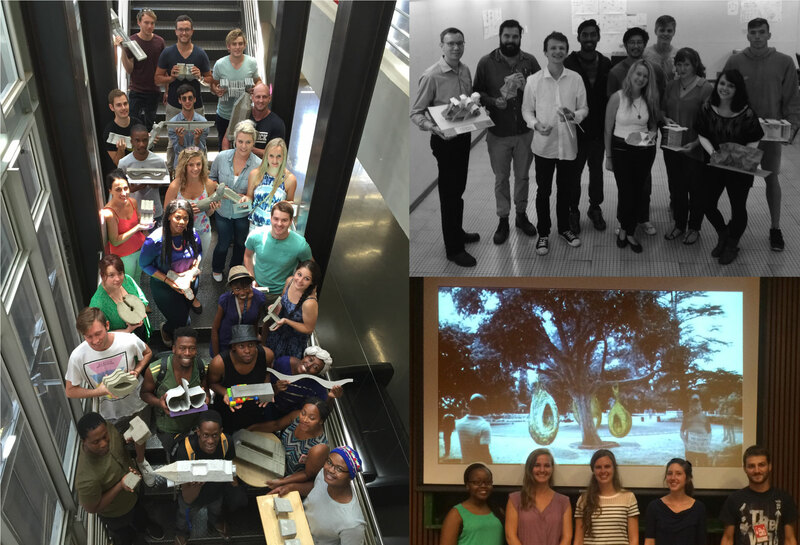 2016 is the second year of the Cool Capital School Projects sponsored by the Atterbury Trust. This year, the projects have not failed to amaze! The schools each worked with a professional artists who helped the learners conceptualise. 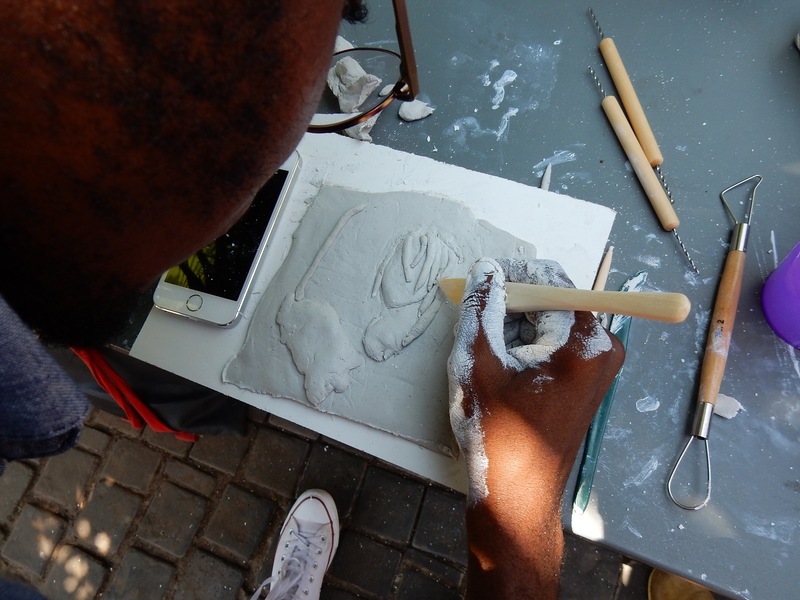 The project gives school learners the opportunity to explore alternative mediums, including making mosaics, welding sculptures, digital print-making, pop-up in situ temporary installations, pottery, stop-frame animation, reinterpretation of traditional craft methods & graffiti amongst others. 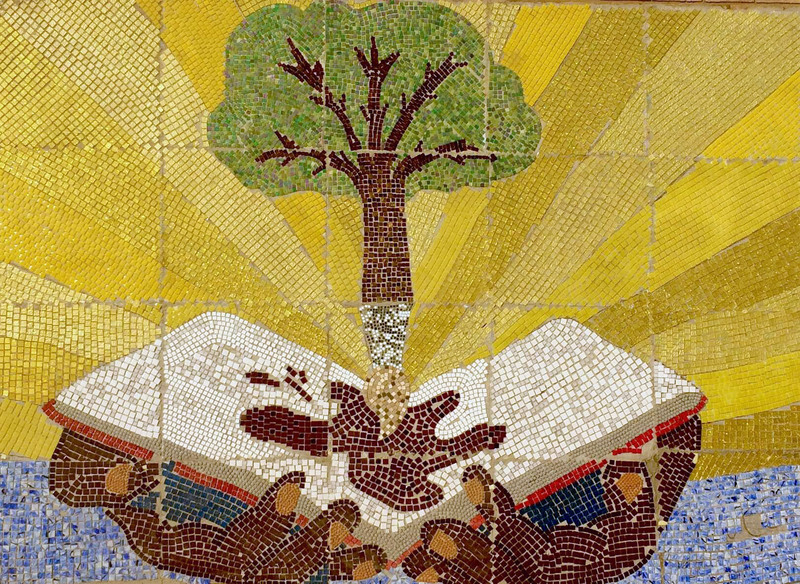 As lasting legacy, the artworks created are donated to the schools, thereby adding value to the school environments. Look out for the stories of individual schools coming soon! Renier le Roux, lecture at TUT Sculpture, presented a Relief Modelling Class this past Saturday at Archneer. All ages were welcome and no background in the arts was necessary to participate. Students modeled while Renier explained and guided the artists. What a great way to learn something new and get your hands dirty! An international participant joins Cool Capital! After a quiet year, a breath of life was blown into the embers of Molo Mollo for Cool Capital 2016. 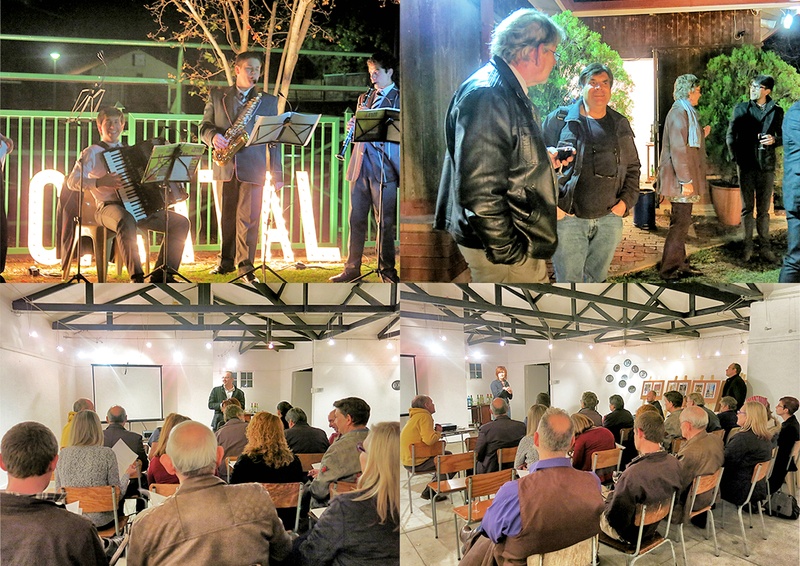 Graphic designer, musician and film-fanatic Louis Minnaar shared his passion and dreams for the first ever Afrikaans Sci-Fi film, entitled SIKLUS on the rooftop of Bank Towers building on 5 October. 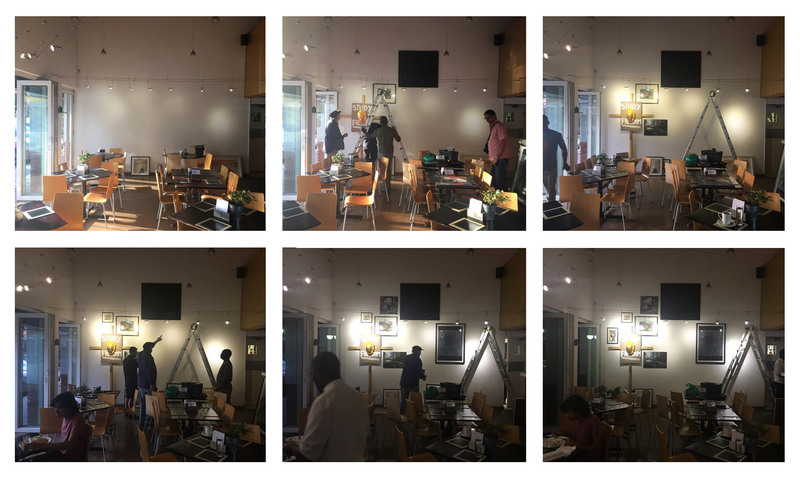 A second event this past week showcased a mixed-media collaborative project, METROPOLAR, by Modise Sekgothe and Jotam Schoeman. Rain could not deter Molo Mollo - an alternative venue was quickly organised at the last minute by the team at 012 Central. We hope to see more of Molo Mollo in the upcoming months! Your chance to visit Pretoria's Foundries! 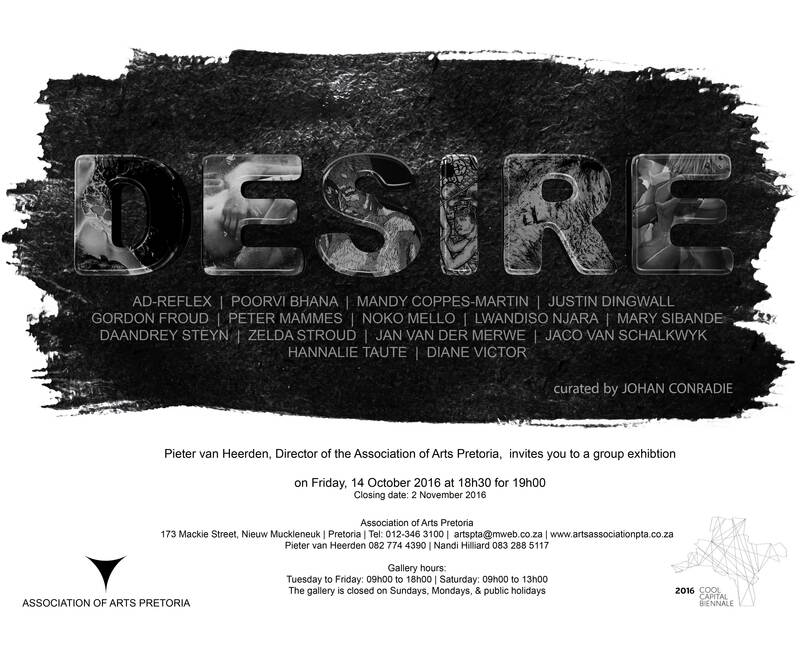 Join us for "DESIRE", a group exhibition curated by Johan Conradie and presented at The Association of Arts Pretoria from 14 October – 2 November 2016. ABOUT THE EXHIBITION: 'We were born from desire. It is desire that moves us, and, in moving us, gives our lives direction and meaning. Fundamentally, we are each bound to our desires like a slave to his master. Our intellects, in which we place so much faith, evolved to assist us in our pursuit of the desirable and avoidance of the undesirable. The mind, in spite of our attempts to harness it, did not evolve to enable us to resist our desires, still less to transcend them. Pride, envy, gluttony, greed, lust, anger, and sloth have historically formed part of a conceptual system to manipulate the individual’s spiritual shortcomings. Additionally, advertisers exploit the process of desire formation by sowing the seeds of desire into our unconscious, and then supplying various prosaic reasons with which our conscious can justify the desire. This exhibition boldly explores how we engage, or fail to engage with desire.' 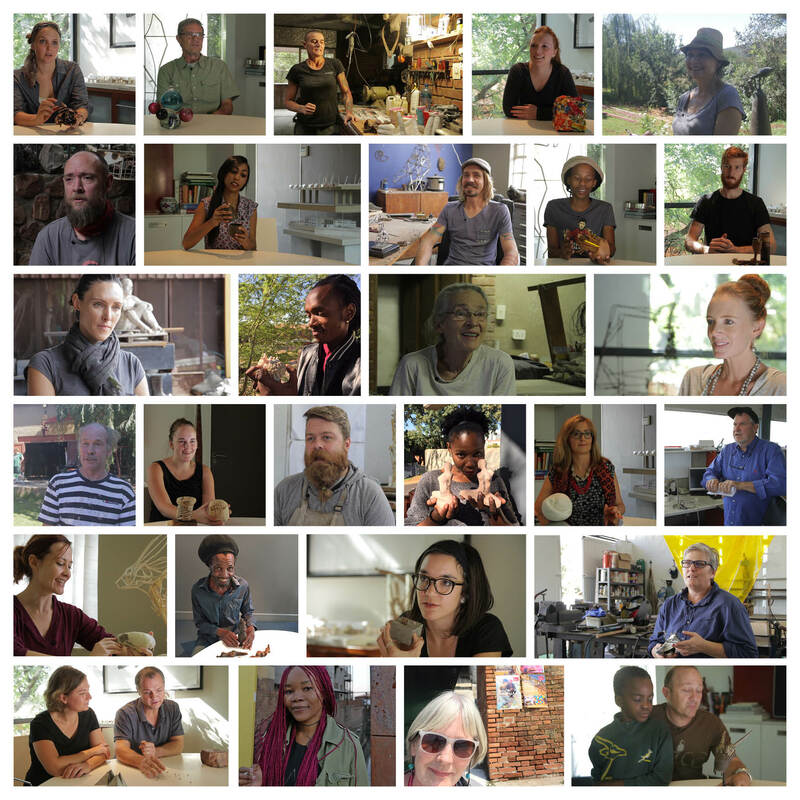 Artists include AD-Reflex, Poorvi Bhana, Mandy Coppes-Martin, Justin Dingwall, Gordon Froud, Peter Mammes, Noko Mello, Lwandiso Njara, Mary Sibande, Daandrey Steyn, Zelda Stroud, Jan van der Merwe, Jaco van Schalkwyk, Hannalie Taute and Diane Victor. Beautiful work by the art students at Soshanguve South Secondary School! The learners were encouraged to use art as means for personal expression. In their collective work nature, community and a healthy learning environment are identified as strengths enabling them to reach their aspirations. Thank you to the Atterbury Trust, proud sponsor of the Cool Capital School’s Project, artist Goitsone Moerane and the team from the Art for Expression Programme. Pragtige werk by Soshanguve South Secondary School! Die muurskildery beeld die natuur, gemeenskap en ‘n gesonde leeromgewing uit as bates wat leerlinge toelaat om hul drome na te jaag. Dankie aan die Atterbury Trust, getroue ondersteuner van die Cool Capital Skoleprojek. 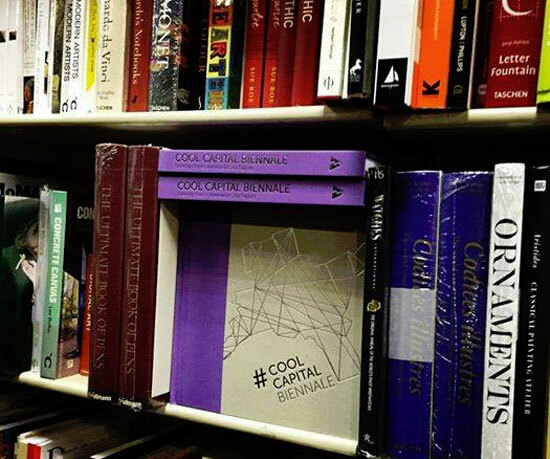 Cool Capital is off to Venice! The news is out: Cool Capital will be exhibited from May to November 2016 at the 15th International Architecture Exhibition at La Biennale di Venezia! We are excited to share your work with the international community: packaging for the shipment is underway and the construction of the pavilion in Venice has commenced. 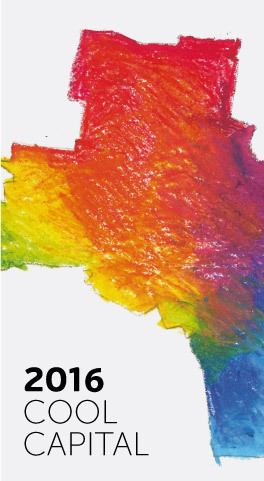 Be sure to visit the pavilion website for more information on the exhibition http://www.southafrican2016pavilion.co.za/. As always, we will share the stories and keep you updated on facebook. Thank you to the Cool Capital community for your continued support and enthusiasm! 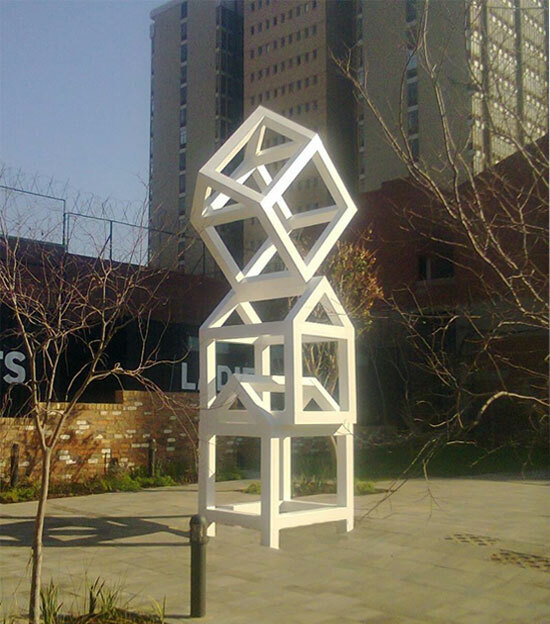 In 2014 the Cool Capital Biennale started the “Sculpture Capital” project with the aim of leaving a legacy of sculpture works in the city of Pretoria and to promote the city’s sculptural heritage during the Cool Capital Biennale every two years: Pretoria boasts the most foundries in the country, the oldest and the most technologically advanced. Some of our foremost sculptors also call it their home. 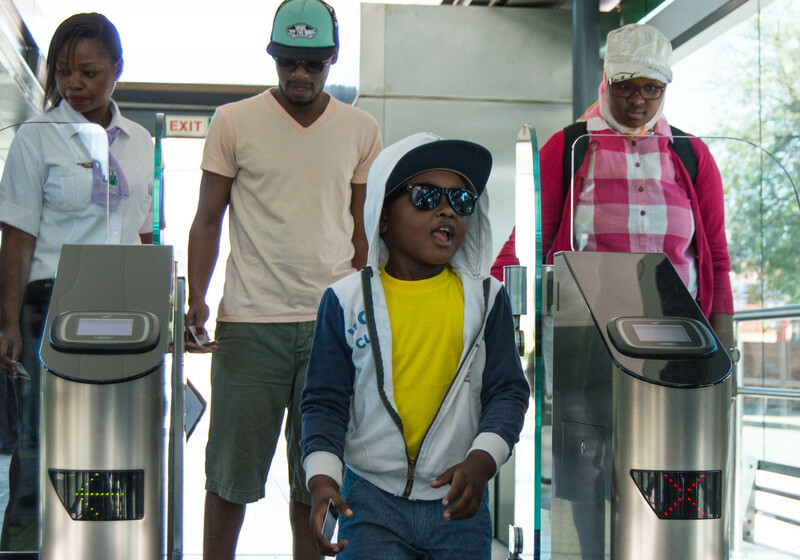 Saadjies is the 2016 Cool Capital sculpture flagship project and aligns itself to this year’s theme of “small is big”. Sculptors will be invited to submit either a set or series of small sculptures not bigger than 180mm x 180mm x 180mm to form part of a travelling sculpture exhibition. The small size of the sculptures will prove that art in the public domain does not need to be big. Sculptors who are interested in participating can contact Carla Taljaard info@coolcapital.co.za for more information. 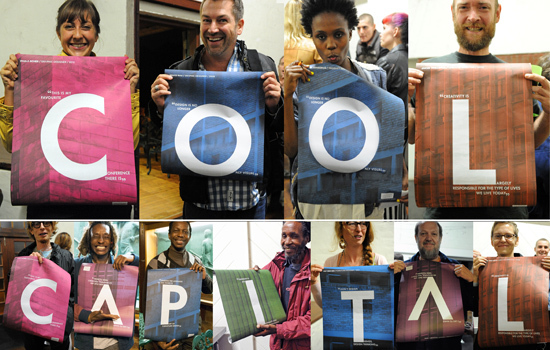 Cool Capital 2016 Projects Underway! Lookout for these three exciting projects. We are proud to say that three projects are well on their way at the Departments of Architecture at the University of Pretoria and Tshwane University of Technology respectively. The 2nd year architecture students at UP are designing alternative beehives and creating an awareness of the ecological importance of bees. The PPC Public Bench Project involves the 4th years at TUT. 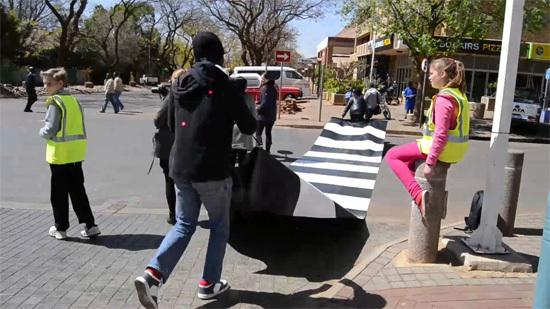 Public benches will, once again, be placed in various locations around Pretoria. Finally, the Honours students at UP have presented their ideas for independent small scale projects that will involve the community to improve various urban issues. We look forward to seeing these projects implemented as part of the Biennale later this year! Our launch in the news! 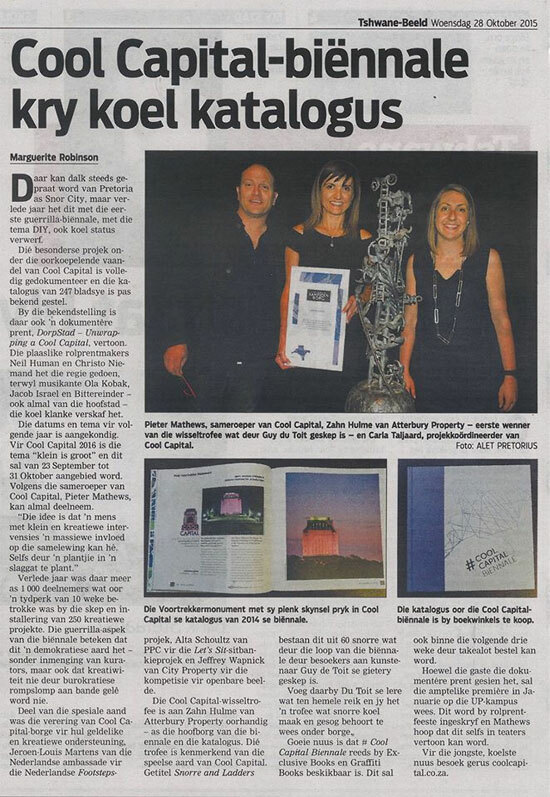 The Beeld wrote a great article about our launch. 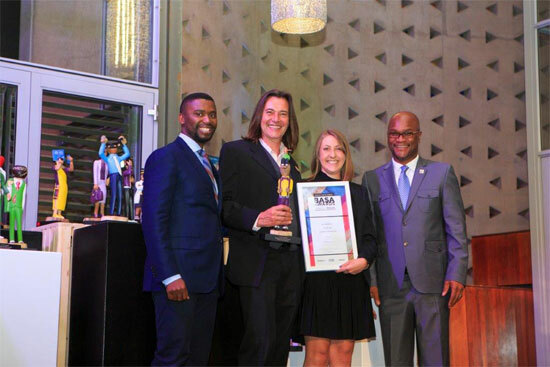 Thursday evening the embassy received the Cool Capital Special Award for the promotion of shared (built) heritage in Pretoria. www.dutchfootsteps.com The ceremony took place during the launch of the book #coolcapitalbiennale by the architect Pieter Mathews and Carla Taljaard. 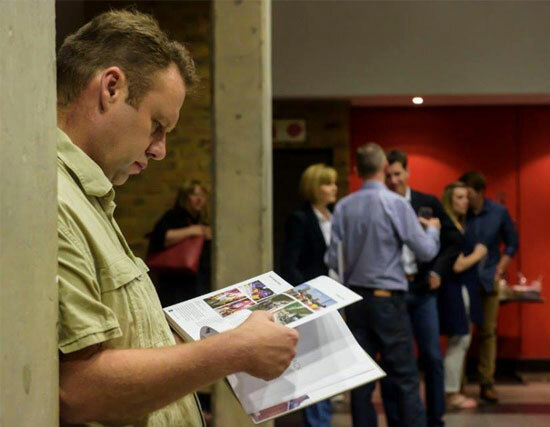 Pieter Mathews is the driving force behind Cool Capital Biennale Pretoria, a showcase of ideas, displays and exhibitions (visual art and design) every two years. What great support we have! 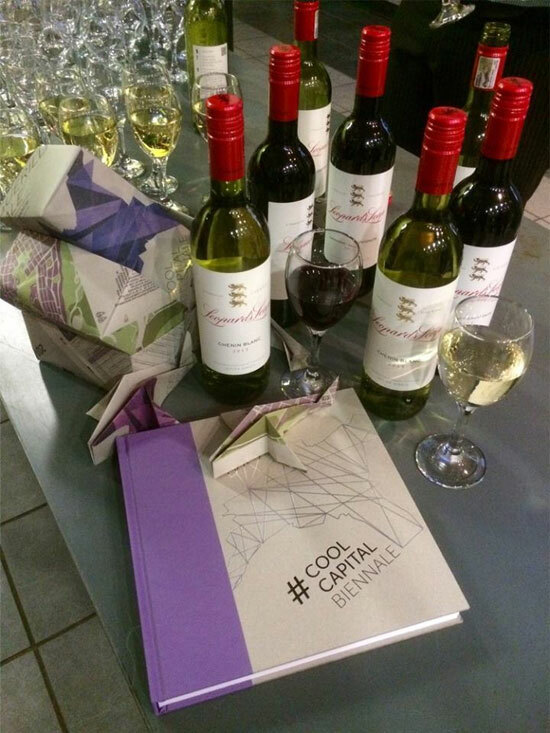 People came in numbers at the Cool Capital Book Launch and Film Premiere! Thank you for your support. The show did indeed go on!! Our books have arrived and are on the shelves at Exclusive Books in Brooklyn Mall! small on budget ... BIG ON CREATIVITY!! You see! Cool Capital installations needn't be big or cost a lot of money! This super cool Jacaranda installation at Trent Gallery are local and beautiful. Well done Stuart and team! Our catalogue is full of projects like these! Make sure you join us on the 22nd or to buy your book! 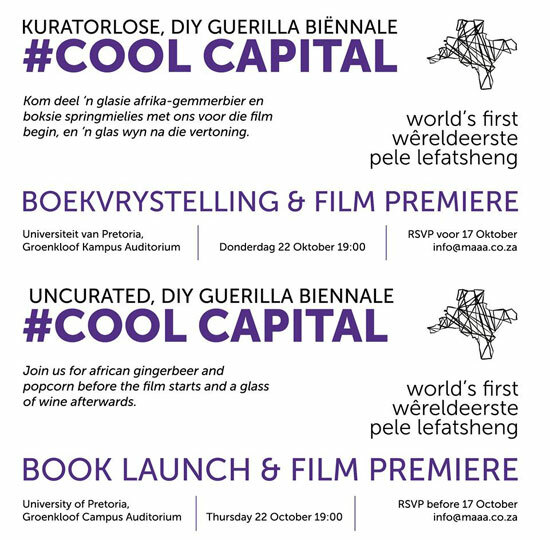 We would like to invite you to our Cool Capital Book Launch and Film Premiere on the 22nd of October. 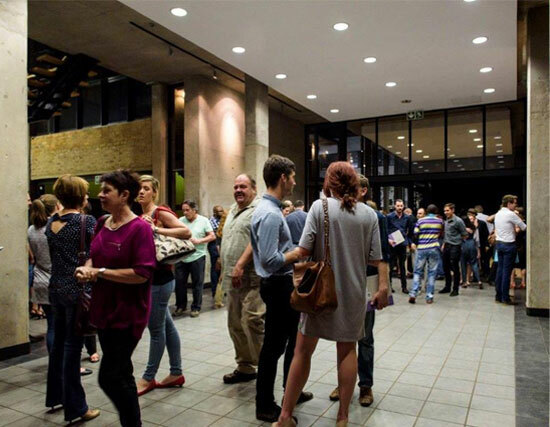 The event will take place at the UP Groenkloof Auditorium. The event is free and absolutely everyone is welcome, but please send an email to info@maaa.co.za if you want to attend, we only have 185 seats left! Thank You! 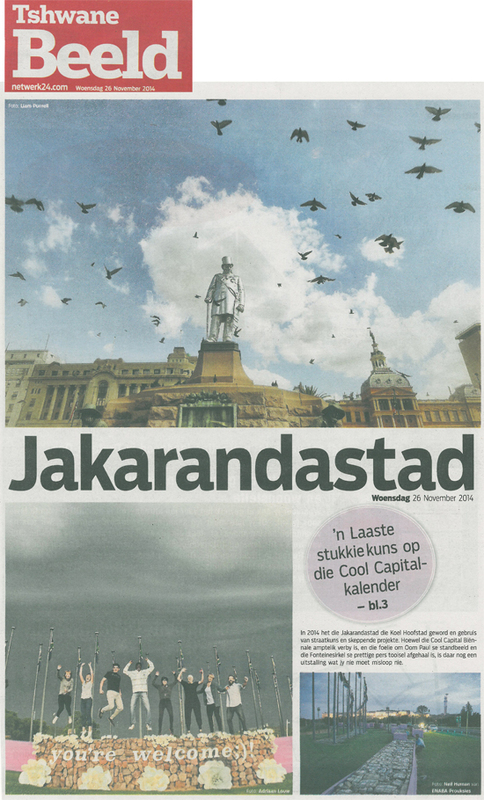 In two weeks time #CoolCapitalBiennale catalogue and #CoolCapital2014 film will blossom like Jakaranda flowers in October! We are so excited to show case the coolest capital!!! "Event's partner believes art is a catalyst for positive change in the country" writes Penny Haw. This was taken from the BusinessDay newspaper article about the BASA Awards. Congratulations to everyone who worked super hard on this project. 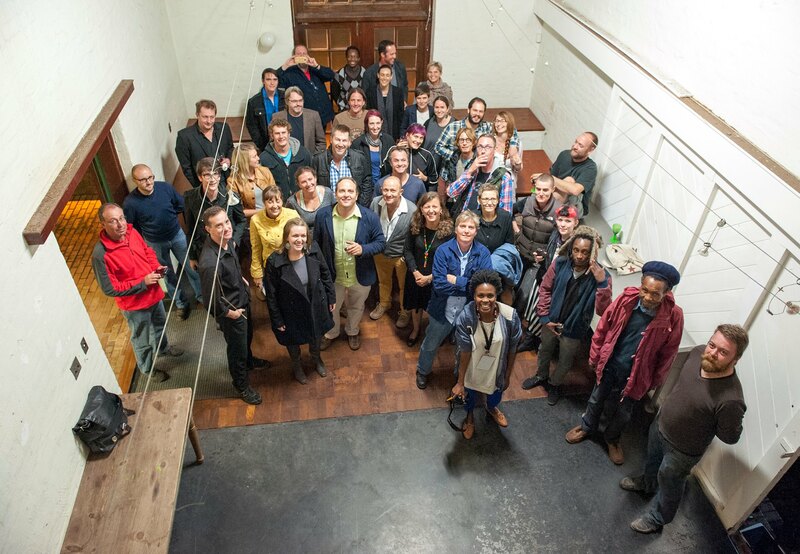 Elani Willemse, Francois Visser, and all the artists and students who made benches! Picture: Kwanele Gumbi (BASA chairman of the board) , Daniel van der Merwe (PPC), Carla Taljaard (Cool Capital) and Nathi Mthethwa (Minister of arts and culture). 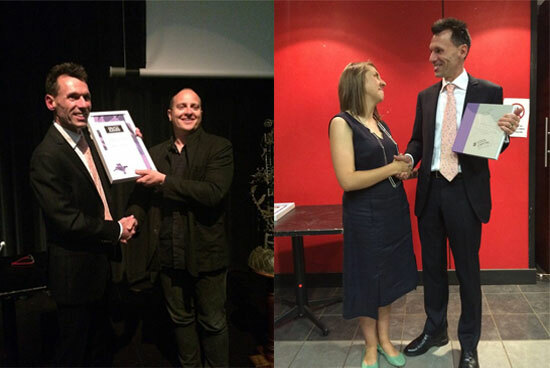 We are super excited and priviledged to have won the prestigious @basa innovation award together with @ppc cement. This is icredible news and we have to congratulate the super artists and sculptors as well! 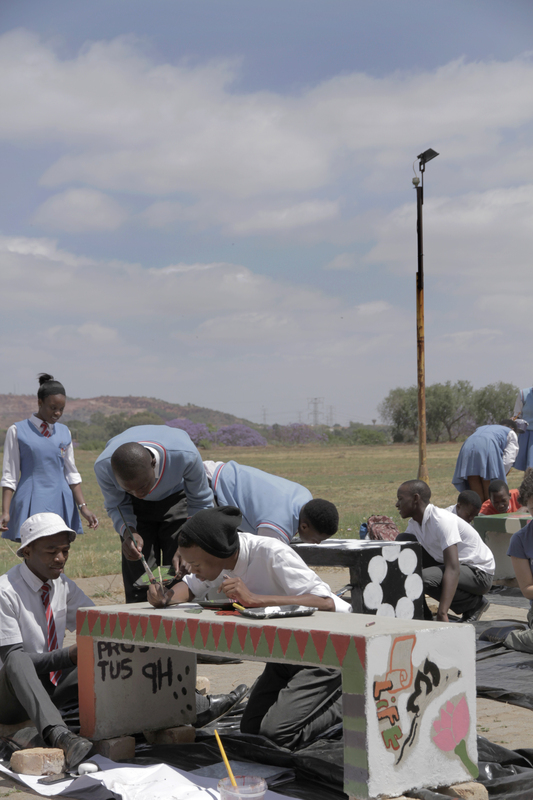 The Wishing tree was the Cool Capital Art project of Oos Moot High School together with the Atterbury Trust. Yesterday, the second part of this artwork was installed. 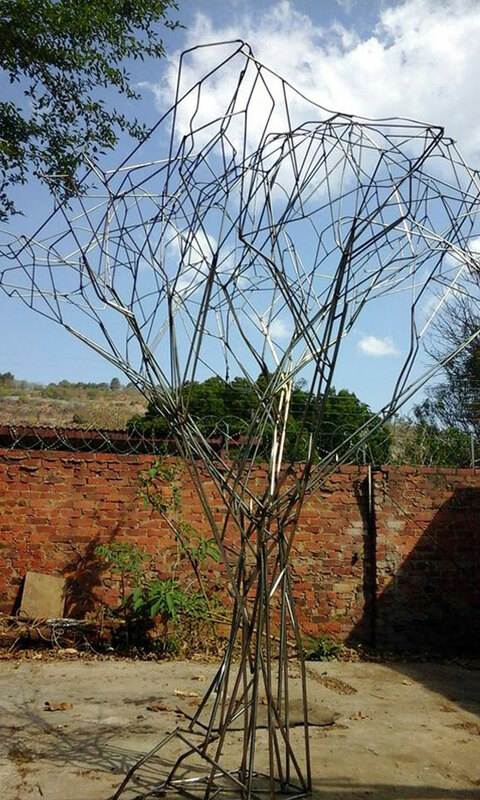 A pierneef-inspired steel tree, by sculptor Sanna Swart. Today the second of our three public sculptures in the CBD were installed. 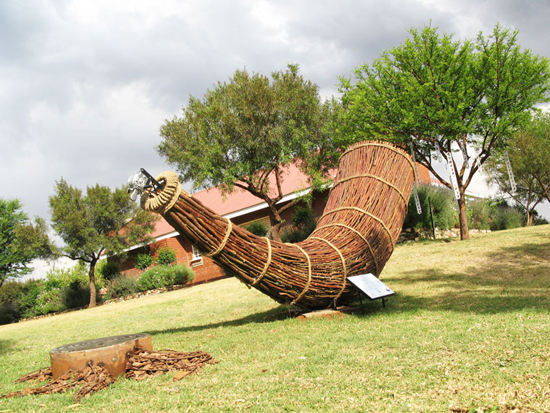 This piece is called Mme Wa Phukubje (The Mother of the Jackal in SeSeotho), and is located in Du Toit Street. Check it out if you drive by. Congratulations to sculptor Johann Nortje and his team. ?#?ourcapitalsculpture? ?#?supportyourcity? Keeping art and businesses alive in Pappstad! We are proud and excited for two Cool Capital 2014 projects that have been nominated for the 18th Business and Arts South Africa awards. 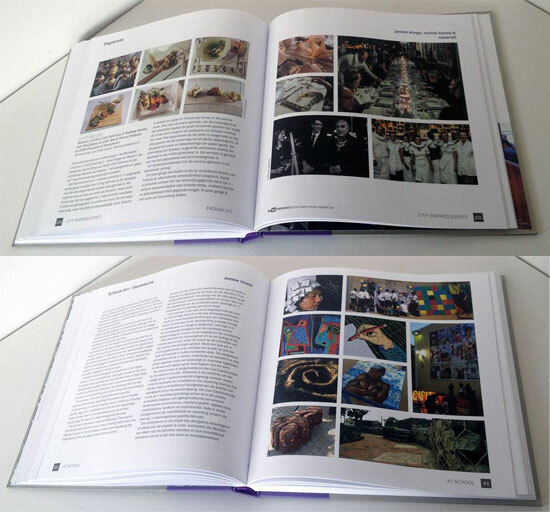 Here is a page of one of the projects in our Catalogue. Well done to Fried Contemporary Art Gallery, Harrie's Pancakes and PPC Ltd, and also Francois Visser, Elani Willemse, our bench artists and everyone at Dionysus Sculpture Works. We could not have done it without you! Here are the catalogues. They look amazing. We are super proud and honoured to have been part something so amazing and creative! And our first public sculpture from the Cool Capital 2014 City Property sculpture competition is up! This interactive piece by artist Strijdom van der Merwe is one of the three commissioned pieces for the 2014 Biennale and is located in the brand new 012 Precinct at 385 Helen Joseph Street. Go check it our over the weekend. High fives all around! We're a Loerie Ubuntu Award Finalist! 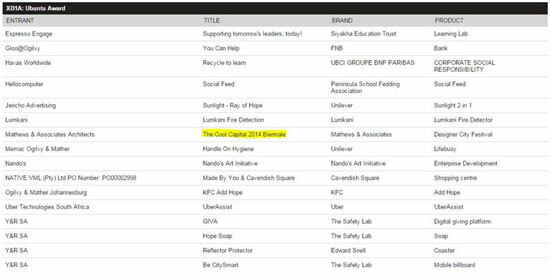 Last night we received the wonderful news that Cool Capital 2014 is one of the finalists for The Loeries Ubuntu Award. This Award goes to social projects where doing good also means good business. Our Sponsors know this is true, and thanks to them, we are amongst big names now: Nandos, FNB and KFC. Thanks to everyone in the snorcity for all the support and for helping us make the biennale happen. Please hold thumbs for Saturday! 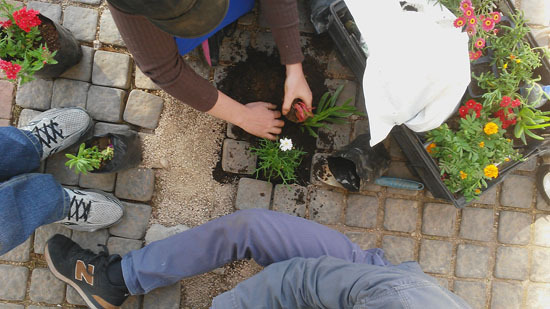 Small steps planted flowering plants in cracks in city pavement, brightening up areal all around Hatfield. This initiative by Jeanne-Louis Lamont is documented on page 70 of our catalogue, which will be on the shelves at the end of September. Be sure to check it out! Koop vandag se Beeld as jy in Pappastad bly. Hier is die voorblad van die Tshwane Beeld insetsel. Geniet ! A tremendous thank you to every organizer, sponsor, volunteer, photographer and participant who made Cool Capital a success. 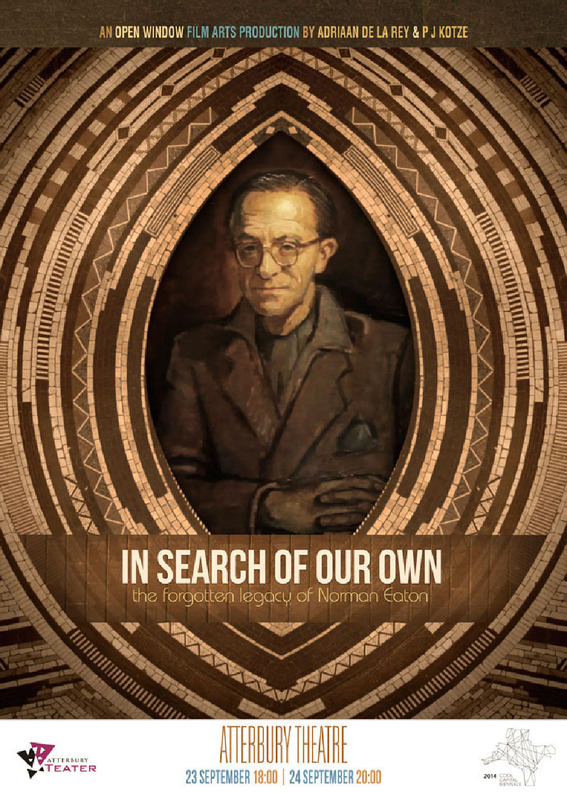 We cannot wait for the fascinating documentary film and captivating 300 page catalogue which will be available next year. 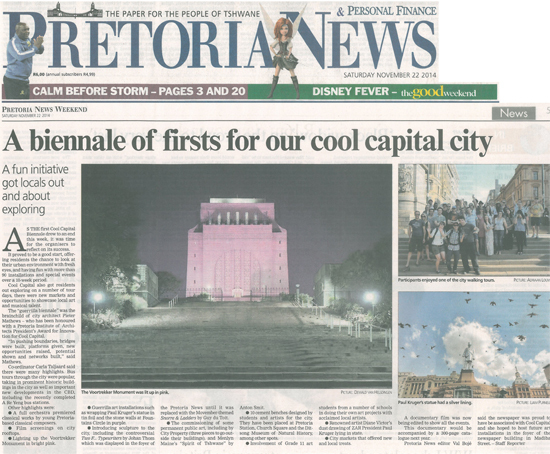 Take a look at the Pretoria News article highlighting a few of our spectacular events. Here is renowned artist Diane Victor's Cool Capital Installation! 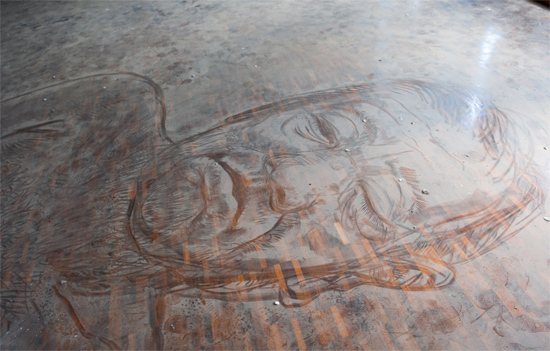 "Let sleeping ghosts lie" is a transient 13 meter dust drawing of ZAR President Paul Kruger laying in state and was created on 13 November at an undisclosed location in the CBD. Unfortunately you will have to wait for the documentary and catalogue next year to find out more. A massive Thank You to Diane and all who made this installation possible. It is definitely a first for the Capital and astonishing to see such boundaries being pushed. Alas all good things must come to an end. The Cool Capital 2014 Biennale has brought some magnificent experiences, memories and friends along the way. We will be featuring many highlights in the next few days so stay tuned in. 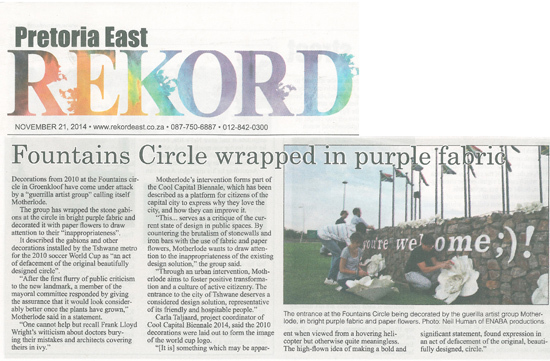 Featured below is today's Rekord's article about our well-known fountains circle. Take a peak. A huge thank you to WitOpWit for making this fabulous event possible. Take a look at the Pretoria News article which was featured on Monday. 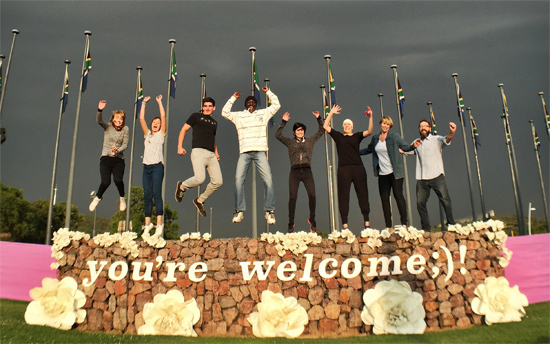 If you watched Die Nataniël Tafel last night, you will have seen the maestros of Hazelwood Carlton Café + Delicious, Nataniël, Shop Wonen+ and Freedom Of Movement celebrate Pretoria in style. Nou is dit JOU kans: Pappastad word hierdie Sondag 159 jaar oud. Bak 'n koek, dek 'n tafel of hou 'n braaivleis, maar wys ons hoe JY die dag gevier het, en staan 'n kans om 'n fantastiese Cool Capital 2014 geskenk te wen. Jou partytjie sal gepubliseer word en in ons koffietafelboek opgeneem word! 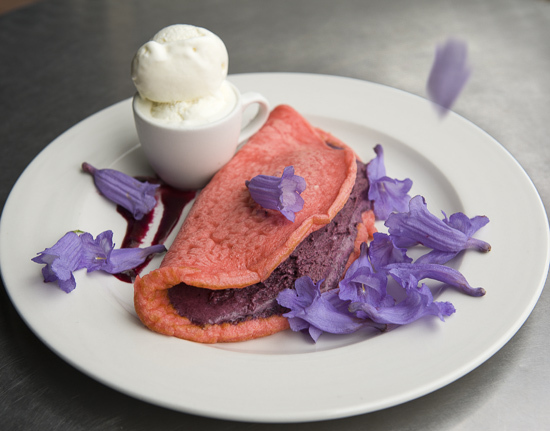 Take inspiration from @MAP-South Africa's purple pancakes for Pretoria at Harrie's Pancakes. Thanks Carla Crafford for the photograph! Take a drive to the Pretoria fountains circle to get a look at "you're welcome", the guerilla fabric bomb. This installation went up at 03:00 AM Monday morning. Go check it out. Photograph by Adriaan Louw. Have you driven along Long Street or Jan Shoba Street lately? Thank you to Absolute Containers: https://www.facebook.com/AContainers , and Open Window Institute: https://www.facebook.com/theopenwindow for providing the necessary resources to make this Cool Capital Street Intervention a mega success. Are you interested in Urban Furniture? 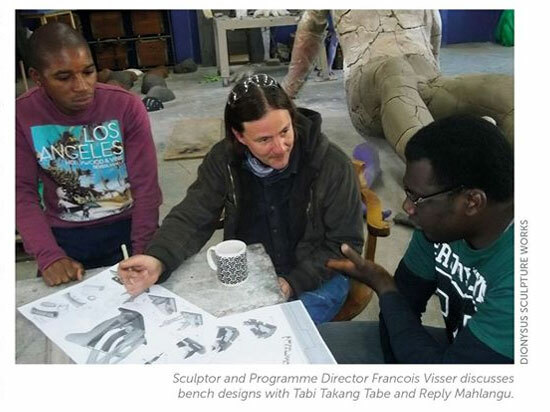 -> Francois Visser's bench installed at the Pretoria Art Museum. 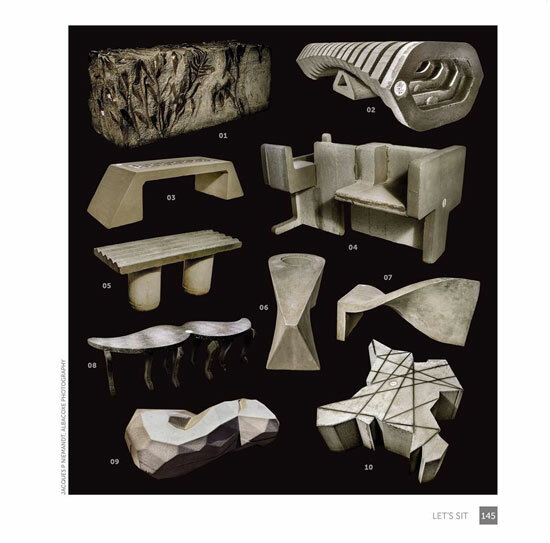 -> Alexander von Klitzing's bench at the Association of Arts Pretoria. -> Izanne Wiid's bench at the Jan Celliers park. -> Cool Capital Logo bench can be found at the Gautrain station. -> Tabi Tabe 's bench at the Ditsong Museum of Natural history. -> George Magampa's bench at City Hall Gardens at Chief Tshwane -> The Sybrand Wiechers (Snorbankie )on Church Square at Café Riche. -> Reply Mahlangu's bench at the new TRT station on Nana Sita street. 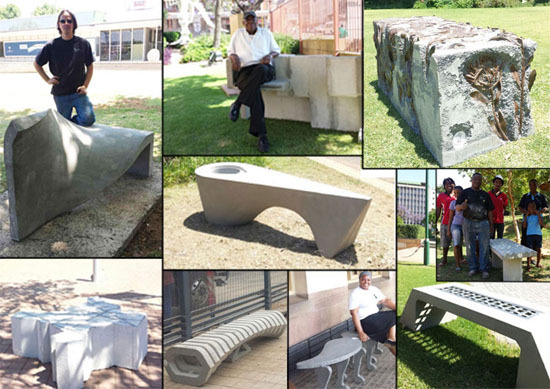 -> Robert Ramavhale's bench at the The Viva Foundation of South Africa in Mamelodi. 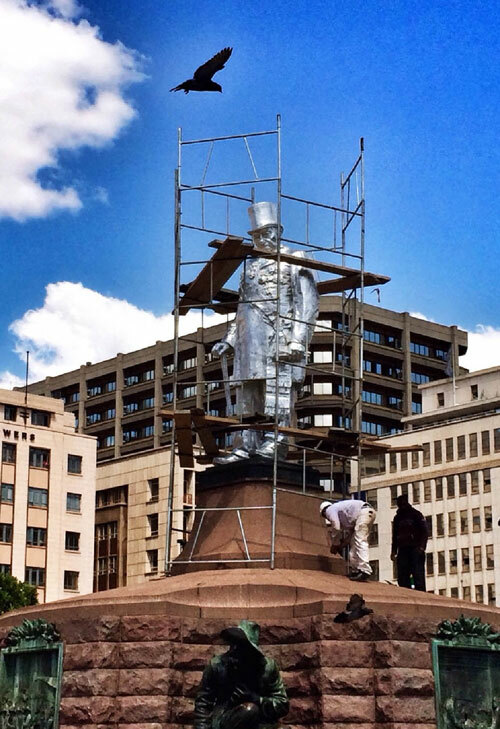 SILVERLINING: Oom Paul has not been painted or covered in mirrors but has in fact been covered in tinfoil. He will return to his original state on the 16 November 2014. 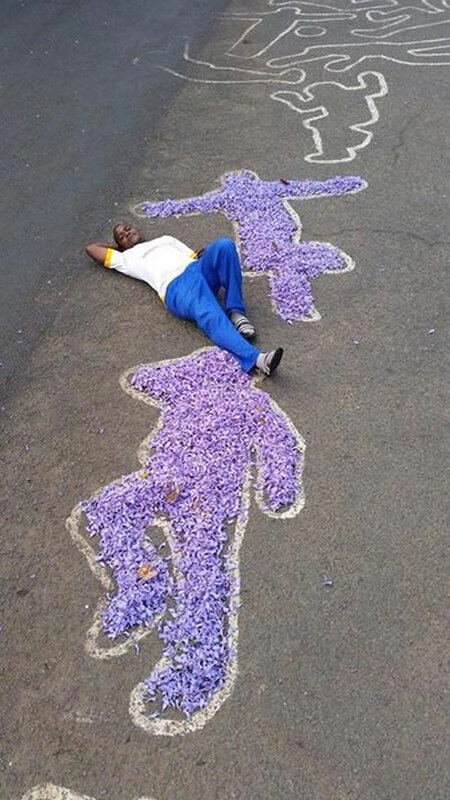 The installation was done by street artist r1. https://www.facebook.com/pages/R1/532318476827672 http://r1r1r1.net/walls . An Installation like this takes a lot of time and effort and we would like to thank Stephan Welz from Strauss & Company and Roel Jansen from Sandstone Contracts for their generous help. Have a glance at Saturday's Pretoria News. in collaboration with Jan van der Merwe . This initiative comments on the way Hatfield has been thrown with cement, pushing out every possible bit of greenery. The gardening project is not unique in the world, however, it has a special place in South Africa because plants are needed to thrive on carelessness and the South African heat. If one looks closely, you would notice that in spite of Hatfield being a concrete jungle, every few steps there is a missing brick, or a crack in the floor where the soil peeps out. 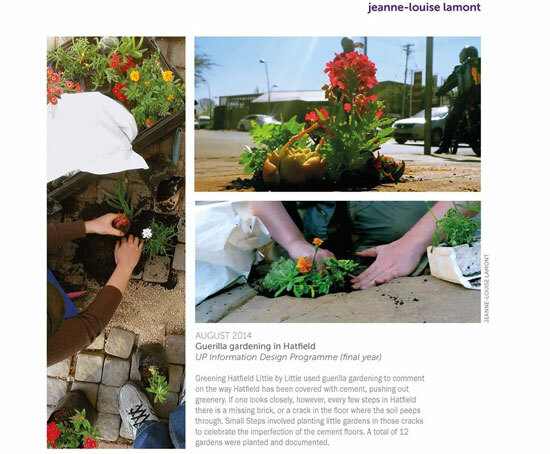 The initiative that Jeanne-Louise decided on was to plant tiny gardens within the cement cracks in order to make the imperfections beautiful. Foundries around the Capital opened their doors to the public in a showcase of the various methods each foundry uses to create art. 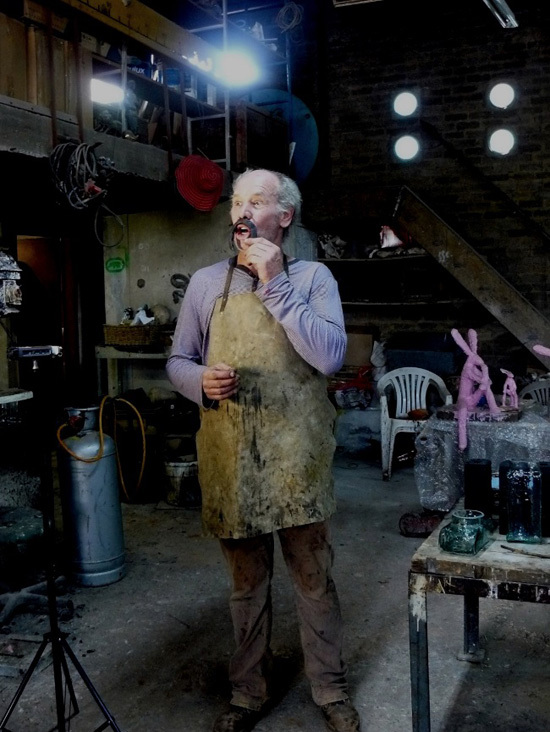 Each foundry hosted a casting, varying from going back to the "roots" of this art form, to the most technologically advanced methods and equipment. What an experience! Photography by Pieter Mathews of Lourina Grobler. Saturday was a great day spent at the foundry. 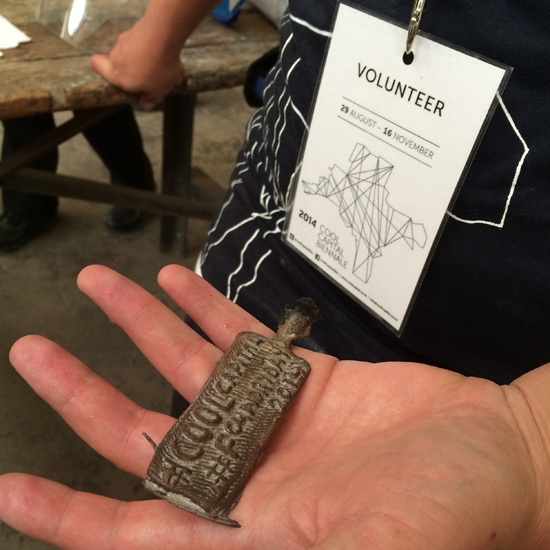 Don't miss our next Foundry day on the 20th of September 2014. 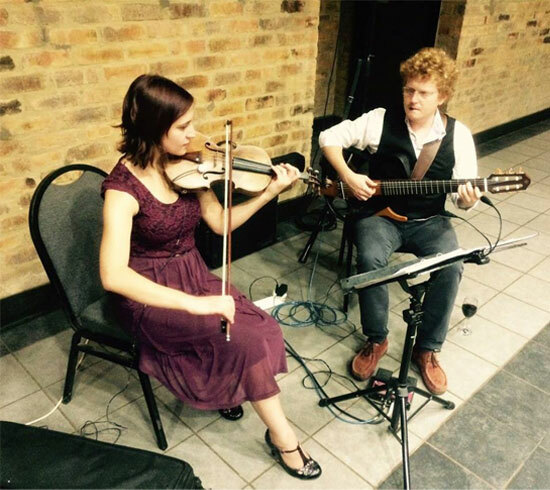 20 September schedule: 10:30 – 12:30 Du Toit Sculptures (End of Atterbury rd. Plot 120 Zwavelpoort, Pretoria East) 13:00 – 14:30 André Otto Sculptures (Lynnwood Road) 15:00 – 17:00 Dsw Dionysus Sculpture Works (Vonkprop Rd. 219, Silverton) Experience all the different foundries of the Capital City. Your School Can Make The Capital City Cool! The launch of the High School Art project proves to be a great initiative. To all the art educators and artists who made last night a huge success, THANK YOU. We are super excited about the High School Project and know that you are the perfect group of people to make the project a reality. Thank you Atterbury Property for their support. Sculptors of the Capital City come together to celebrate the sculptural heritage of the city and to discuss the bright future of sculpture. In a historical event renowned Pretoria based sculptors, including Angus Taylor, Sybrand Wiechers, Sanna Swart, Francois Visser, Izanne Wiid and Rina Stutzer (amongst others) gathered at the Van Wouw House-Museum on 13 March for the official Our Sculpture Capital Launch. As part of the Cool Capital 2014 initiative, which is described as the world’s first uncurated do-it-yourself guerilla biennale, the project aims to introduce the public to a wealth of art, architecture, design, and sculpture creations. The launch was opened by artist Daniel Mosaka, where after architect Pieter Mathews introduced the origin of the concept for Cool Capital 2014 which was inspired by a poster at the 2012 Venice Biennale stating that viewers should “take this to your city”. 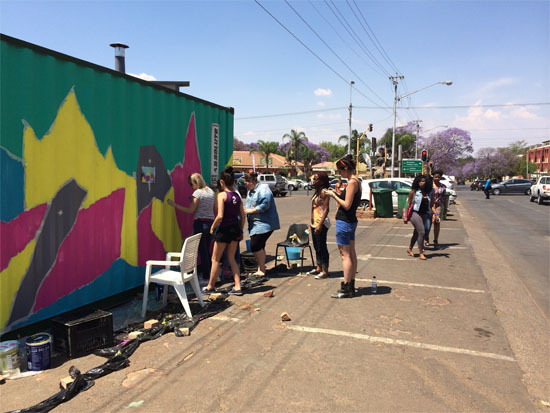 Matthews took to the challenge and the idea of a Pretoria-based guerilla biennale, a showcase of local creativity where individuals from all backgrounds can add value to their environment, was born. Now two years later, the first official Cool Capital 2014 guerilla biennale is set to take place from 29 August to 15 November. This will coincide with the official birthday of Pretoria in a showcase of the capital’s contemporary creative ideas while at the same time celebrating the rich cultural and artistic heritage which the city has to offer. 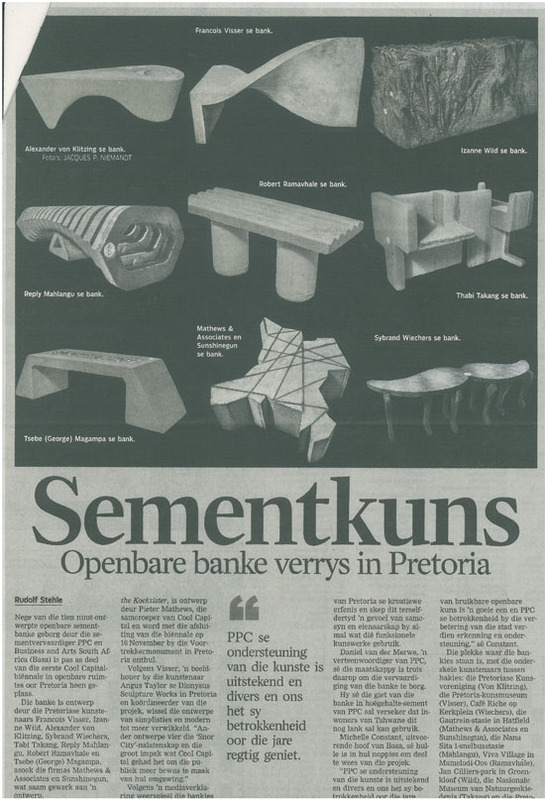 Mathews described the important part that the Pretoria has played in South African Sculpture, adding sculptors like Anton van Wouw, Jo Roos, Coert Steynberg and Hennie Potgieter amongst the list of artists who called the city their home. According to Our Sculpture Capital Program Director Angus Taylor the first South African foundries were based in Pretoria, underscoring the capital’s sculptural significance through the many art foundries currently operating there today. These include the Renzo Vignali Artistic Foundry, a historical foundry headed by Carlo Gamberini, Dionysus Sculpture Works under the leadership of Angus Taylor, the first foundry initiated by a female artist, Boudiccea Castings headed by Sanna Swart and other foundries operated by artists such as Guy du Toit, Renier le Roux, and Daniel Nel. Taylor pointed to similarities between the DIY nature of Cool Capital and the gift-economy present at artistic events such as AfrikaBurn, where the economy thrives on creativity and not finance. This testifies to the vibrant culture of current sculpture activities in the Capital.